The Tao Te Ching of Sales is all about non-pushy sales. It’s about listening, building relationships and finding connections that match your solutions to the buyers needs. With this in mind I’m building a Webinar that will explain this process with great clarity and depth. This new course is called. 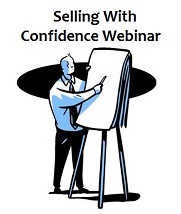 Do you lack confidence in your selling skills? Are you fumbling cold calls, unsure what to say? Do you lack a formal sales process and forget to follow up? Do clients keep stalling and never agreeing to buy? Lastly are you running out of time? This webinar talks about the fundamentals of sales. Whether it be Business to Business (B2B) or Business to Customer (B2C) the fundamentals remain the same. You can apply these in many situations because no matter what, at some level you’re selling P2P, Person to Person. It’s building that connection to people, is the trick. I’ll talk about the…. These are learned skills. People aren’t born to sales. Sales is like any else, it has a set of processes, goals and best practices defined over time. Sales has been a part of civilization since ancient Sumeria and the Silk Road. As such there are rules of thumb that anyone can discover. For example we’ll go into great detail and show the …. and walk through each stage so you’ll know what to do and when to do it. With the onset of the Internet, the process of sales has dramatically evolved. Notions of being aggressive, hard-nosed, pushy and obnoxious no longer work. Sales has evolved into a more collaborative process. And that’s exactly what we’ll cover. Believe or not but you’ll be able to apply this mindset immediately that day. Sales is surprisingly simple, but only if you break it down to it’s fundamentals. This is precisely what you’ll experience in Selling With Confidence. This is all about non-pushy sales. Make Sales. Grow Your Business. With this one webinar you can double, maybe triple your business prospects in 30 days. But most importantly, you will build customers for life. This class is totally free. I’d love to have you join us.